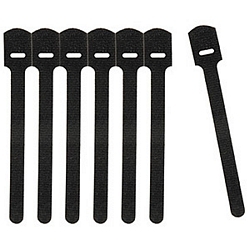 Perfect for managing small cables, the Rip-Tie mini cable ties are short reusable hook-and-loop fasteners that can be used hundreds of times. Keep the wraps on cell phone chargers, earphones or sync cables under control. The Rip-Tie mini tie wraps are each 3 1/2" long and 1/2" wide at the head with a 1/4"-wide band.